If you spent the weekend pulling out spring attire our of the closet, hoping you'd just seen the last winter storm of the year, well, there's bad news coming after this sentence. Winter storm Stella is headed to the east coast after a successful snow dump across the northern midwest. 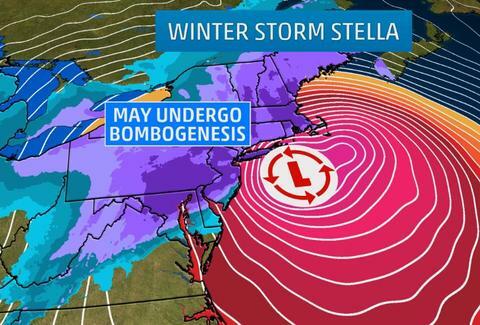 Stella is about to hit the east coast and it's going to become a snowy, snowy nor'easter. Meteorologists project Stella will dump a foot or more across the upper east coast. That includes forecasts that reach as high as 24 inches of snow for cities from Baltimore up to Maine. The storm is expected to unleash its fury Monday night into Tuesday morning. Weather.com says the storm may turn into a "weather bomb" or undergo bombogenesis, which surely sounds much worse than it is. The term is used to "describe powerful low-pressure systems that intensify rapidly." They note that nor'easters are frequently weather bombs. The phenomenon generally causes increased winds and intense precipitation, such as blizzards which sometimes include lightning. For most of the east coast, residents will face the largest snow accumulation of the winter if conditions stay as expected. That means you have to hit the local store and get all your survival gear now, like Doritos, Fritos, frozen pizza, microwave popcorn, and your parent's Netflix password.